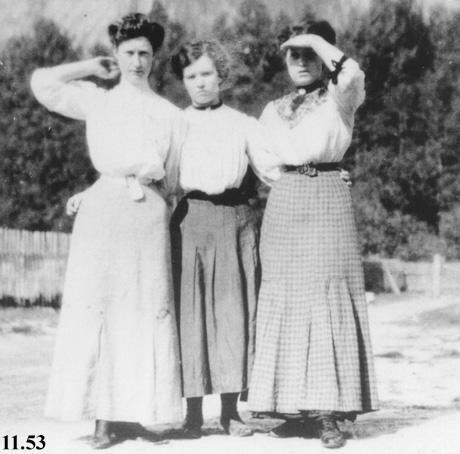 Research compiled by Eric Andersen: Schoolteacher Ella Clements, Minnie Rae, and Mrs Lola Fulk, 1907. Minnie Rae's 1907 diary refers to the Fulks, the upper valley camps, and Owen Fulk's business trips into town by steamship. Owen Fulk of Skagit County (WA) was hired by E.K. Wood Lumber Co. to supervise the Squamish River logging operations. During the five years or so Fulk was at Squamish, he was the valley's preeminent man of business. Andersen, Eric. (2011). Squamish Valley timber was used in building the Panama Canal. Posters lent to the Squamish Public Library, Squamish, BC.